Staff at a Warrington based business bank were proud to celebrate one year since their office unveiling. Redwood Bank Warrington marked the occasion by holding a celebration at their office, located at The Base in Dallam Lane, on Monday 29 October. 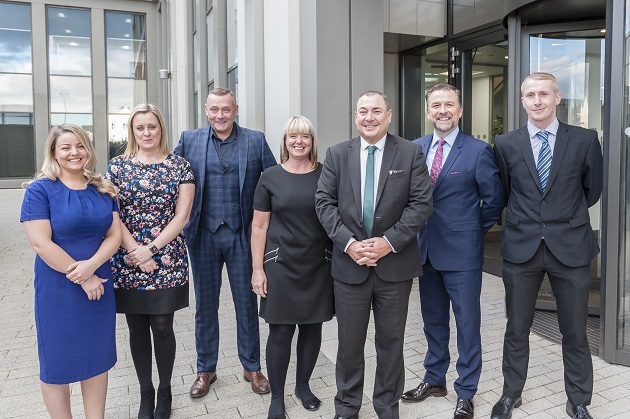 Redwood Bank’s Chief Executive Officer (CEO) and Co-Founder, Gary Wilkinson, thanked the Warrington team for all their hard work over a successful 12-months. He said: “We’ve had a fantastic year supporting businesses in Warrington and the North-West, and our Warrington office has done a brilliant job. In recognition of their many notable successes, we wanted to celebrate and say thank you to those who have both helped us and joined us on our journey. From left to right, our Warrington team: Naomi Makin (Business Development Officer), Jenny Daniels (Business Development Officer), Chris Finnigan (Senior Business Development Manager), Joanna Carroll (Business Development Officer), Gary Wilkinson (CEO and Co-Founder), Graham Reynolds (Commercial Director) and Ciaran Kilheeney (Business Development Manager). Redwood Bank became Britain’s newest challenger bank for small to medium sized businesses following its initial launch in August last year. Since its inception it has focused heavily on technology, people and service - successfully opening over 1000 saving accounts for businesses and charities. It has also lent around £60m, a significant amount of which has been sourced from Redwood’s Warrington office and secured on properties located in Warrington and the North-West. Redwood Bank was launched with a view to offering a real alternative for small and medium-sized businesses looking to either expand their organisations, or simply save for future growth. With offices in both Letchworth, Hertfordshire, and in Warrington, the triple award-winning business has grown its workforce to 57 people. Recent award successes include Global Business Insight Magazine’s award for England’s Most Outstanding Commercial Mortgages Bank of the Year 2018 and Redwood’s Chief Executive Officer, Gary Wilkinson, has been identified as a CEO of the Year in the UK, representing Hertfordshire, by CEO Monthly Magazine. The Bank’s products include individually-assessed mortgages for business owners and professional landlords, as well as a range of Best Buy savings accounts, which is offered to charities, clubs and associations as well as businesses.